Pendine Sands – May 2016 - 184mph 1.5m record | Racing | Eisenberg Racing - Max Your Life. The MADMAX race team had a superb day racing at the iconic Pendine Sands in Wales with our ZX14 (Sunday 22nd May). The rain cleared from Saturday giving us perfect blue sky and sun. The waves did everyone proud, cleaning up the debris from Saturday and creating the most amazing stretch of perfect sand for about 2.5 + miles! This allowed the amazing Straightliners crew to create a 1 mile and 1.5 mile course with ample braking. Last year Zef set a production bike record on the ZX14 at 164.5mph. After Elvington’s success the week before, I was feeling confident, so not wanting to waste any runs, I nailed it and ended up setting a new 1 mile record on the Zx14 (PP-1650) at 173.4mph on the very first attempt! After lunch, the course was lengthened to 1.5 mile. 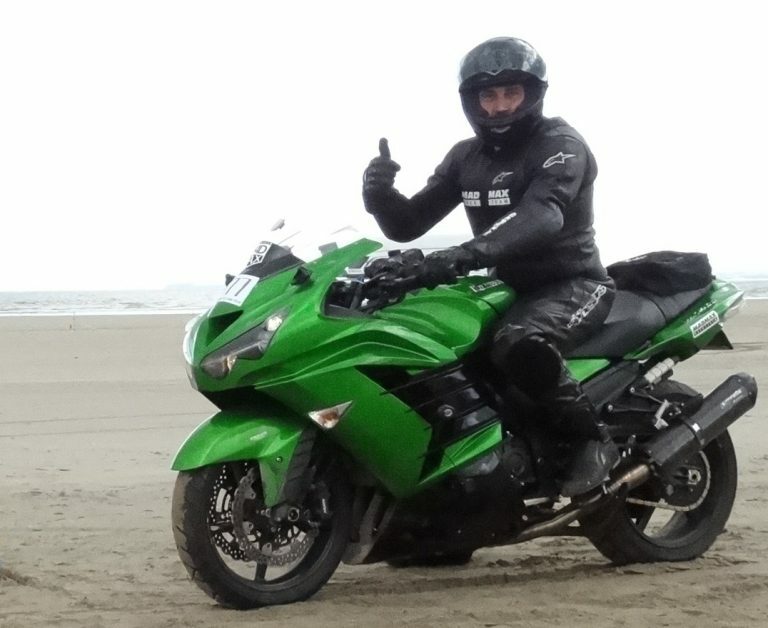 Again on the very first attempt I set a new British record at 184mph, (pp-1650) with the engine bashing against the rev limiter and the bike literally dancing across the sand!